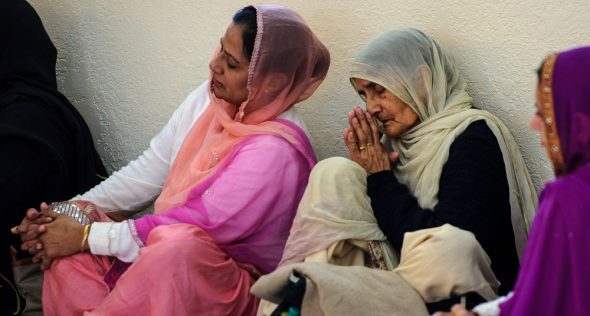 When refugees from India brought their Hindu beliefs to Iowa, there was no official place for their community to worship together. They made do by assembling in homes to practice their faith. 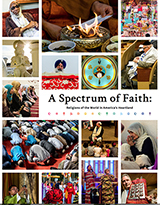 Today the Hindu Temple and Cultural Center of Iowa, an ornate white marble structure that rises above the cornfields 30 miles northwest of Des Moines’ metro, is one of 15 religious communities featured in the Drake Community Press’ latest book, A Spectrum of Faith: Religions of the World in America’s Heartland, released in April 2017. The book, a 134-page coffee-table-style paperback, is a culmination of more than two years of work by Drake students and faculty, an editorial board, a local photographer, donors, community-involved committees, and the Des Moines Area Religious Council. Rich with stunning images, each chapter is a story of one faith community written by a student who spent several months immersed in that community. While the production of the book enhanced the skill sets and portfolios of students and faculty alike, the goal from the beginning was to bring the local diversity of religious faiths and their sacred spaces to light. “One goal of this book is to make Iowans more aware of the rich diversity of religion in their state and how that diversity is a function of Iowa’s rich history of welcoming refugees and immigrants,” said Tim Knepper, professor of philosophy at Drake and editor of the book. From three Jewish synagogues to two Sikh gurdwaras, three Islamic mosques, two churches, one basilica, two Buddhist temples, and two Hindu communities, the diversity moves beyond Protestant and Catholic traditions, which, according to a Pew Center research study, are the predominant religions of most Iowans. Join Tim Knepper, editor, Professor of Philosophy, and Director of The Comparison Project at Drake University; Carol Spaulding-Kruse, publisher, Professor of English, and director of the Drake Community Press; and Bob Blanchard, photographer; at Let’s DU Lunch on September 6 as they discuss how the book was conceived. The event will take place at the Des Moines Embassy Club from 11:30 AM–1 PM. You can register to attend and learn about other 2017 Let’s DU Lunch speakers at alumni.drake.edu/letsdulunch.